Head of Ahmadiyya Muslim Community makes faith inspiring addresses. The 49th Jalsa Salana (Annual Convention) of the Ahmadiyya Muslim Community in the United Kingdom commenced on Friday 21 August at the vast Hampshire farm known as ‘Hadeeqatul Mahdi’. It is anticipated that more than 30,000 delegates from over 90 countries have travelled to attend the Jalsa. 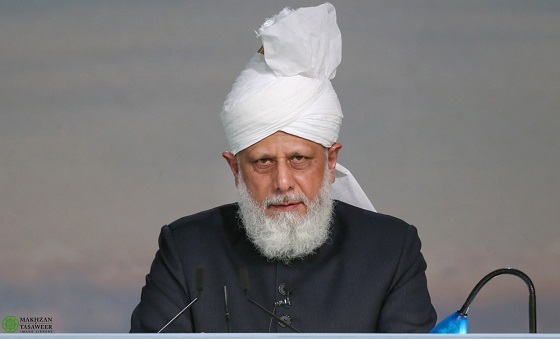 On Friday, the World Head of the Ahmadiyya Muslim Community, the Fifth Khalifa (Caliph), His Holiness, Hazrat Mirza Masroor Ahmad delivered the Friday Sermon and later delivered the inaugural address of this year’s Jalsa Salana during which he said that the purpose of the Jalsa Salana was to promote the true and peaceful teachings of Islam. His Holiness also raised the Flag of the Ahmadiyya Muslim Community, whilst Rafiq Hayat, the National President of the Ahmadiyya Muslim Community in the United Kingdom, raised the Union Jack.In his address, Hazrat Mirza Masroor Ahmad said that where the Jalsa is a spiritual gathering to increase faith in God, it is also be a means of increasing humanity and a sense of brotherhood. His Holiness stated that Ahmadi Muslims must always seek to spiritually and morally enhance themselves. The Jalsa Salana is being broadcast live and streamed online by MTA International to millions of viewers across the world. Share the post "Tens of thousands of Muslims gather in Hampshire for Jalsa Salana"